Photo editor is where you will get to edit your photos using a wide variety of features. For instance, you can use it to fix the poor lighting of your photos or to add various creative effects like frames, filters and overlays to your photos. There are over 200 photo effects to choose from. You can also use it to highlight or blur parts in a photo. Other supported features include: cut and crop, color correction, batch photos processing, supports wide formats (PNG, BMP. Jxr, Jiff, JPEG, TIFF) and many more. This is an excellent tool to help you work on the background of your photos. Whether you want a transparent background for an image or you want to remove and replace the whole background, Photo Cutter makes it super easy for you to do so. With its leading color detection technology, Photo Cutter can automatically deduce the edges if objects with the need for you to edit pixel by pixel. It offers up to 20 preset backgrounds in a variety of styles to choose from. You can remove or change the background of your photos in your easy steps: import your photo, mark the background you want to delete with few lines, Photo Cutter will then erase the selected part, save the object with transparent background or replace the background with your image or a preset template. Photo Eraser, as its name indicated, is an effective way to delete unwanted objects from your photos. You can remove things such as street signs, power lines, unwanted persons, watermarks, date stamps without affecting the background of your photos. You can also use Photo Eraser to remove scratches and other damage marks to repair your old photos. Besides these 3 modules, Fotophire has two more modules (Photo Maximizer and Photo Focus) to be released in the future. 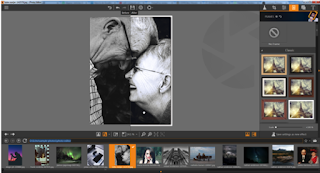 While Fotophire is a powerful photo editing tool you can use to create stunning visuals, it is, unfortunately, available to only Windows users. Also, Fotophire is not free (you can try it for free though). Its pricing plan includes a one year license that was $89.99 and is now $59.99 and includes all features without watermark. You can also get fotophire + Filmora for $89.98 instead of 129.98. It is available for Windows only, and Mac OS and Linux users may feel disenchanted.